This beautiful Pinot Noirs And Chardonnays collection by independent Aussie designer Dominique Bratton is inspired by burgundy for days and watercolor art. The hand painted textural wash gives this invitation suite a warm welcoming vibe and would be perfect for those planning a elegant reception against the New York city skyline, or maybe the Chicago skyline. Wherever the location of your wedding, this colour scheme reminiscent of precious agate will have your guests thinking of high quality and elegance. Let’s not forget, red is also the colour of passion! 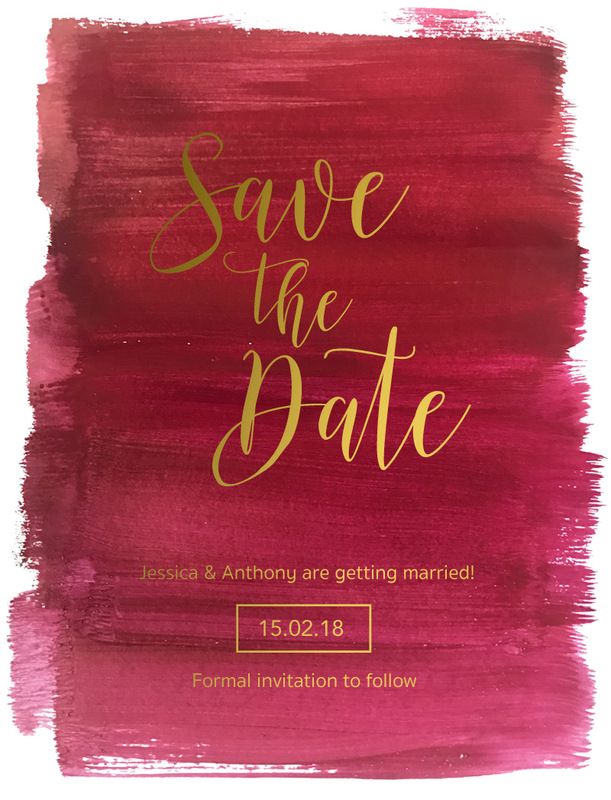 These save the date cards from the larger design collection look fantastic when printed using Metallic technique and when it comes to stocks, we think it looks best on Paperlust 300GSM Matte. Adding a little bit of gold glitter into your wedding without going overboard is a great way to balance glamour with simplicity. The Pinot Noirs and Chardonnays design is for those who love minimalist art, a handcrafted look and the trendiness of gold foil. 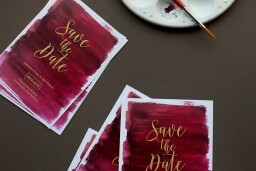 A save the date stamp in gold would look stunning on the back of this envelope.